One great thing about comics as a medium is that nothing is ever set in stone. No one is ever truly dead. Entire universes can be rebooted. More importantly, gaps can be filled in. There are opportunities for stories in even the tiniest crevices of a character's history. 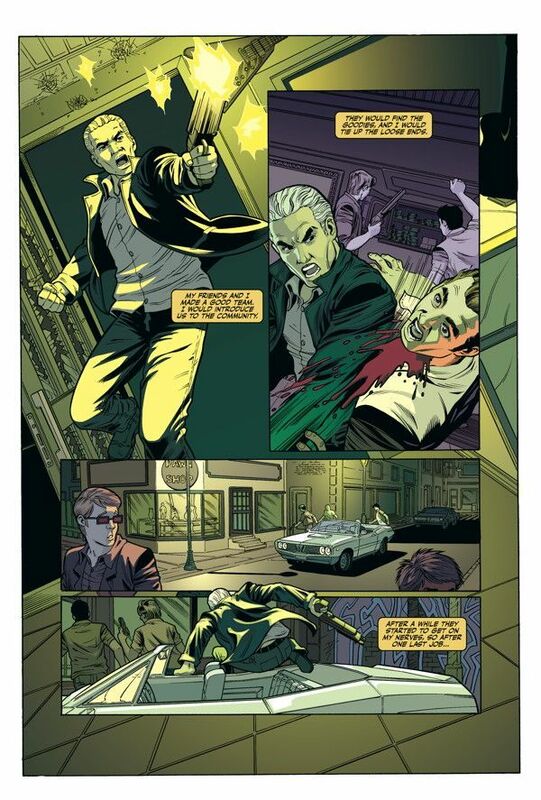 That's where Spike: Into the Light lives, showing what happened to the vampire shortly after he regained his soul. 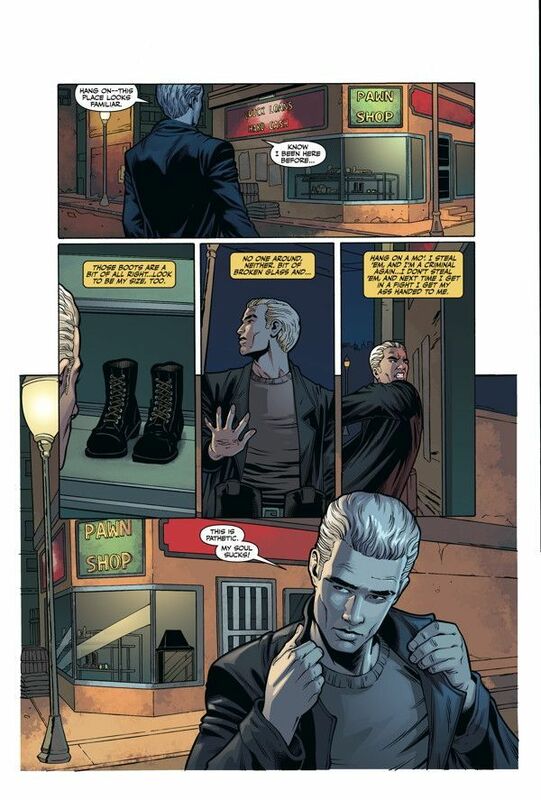 The book is written by James Marsters, who portrayed Spike in Buffy the Vampire Slayer. The story picks up near the beginning of Buffy Season 7. Spike is lurking about in a small California town, not quite ready to return to Sunnydale. He's having trouble adjusting to all these feelings that came back with his soul. He was used to stealing and killing. Now he has to learn to live like a normal person...who happens to drink blood. After saving a young woman named Dylan from some thugs, Spike reminisces on his past and struggles to figure out what to do next. Fortunately, there's a big ugly demon stealing children in the area, so punching something can help bring him some closure. 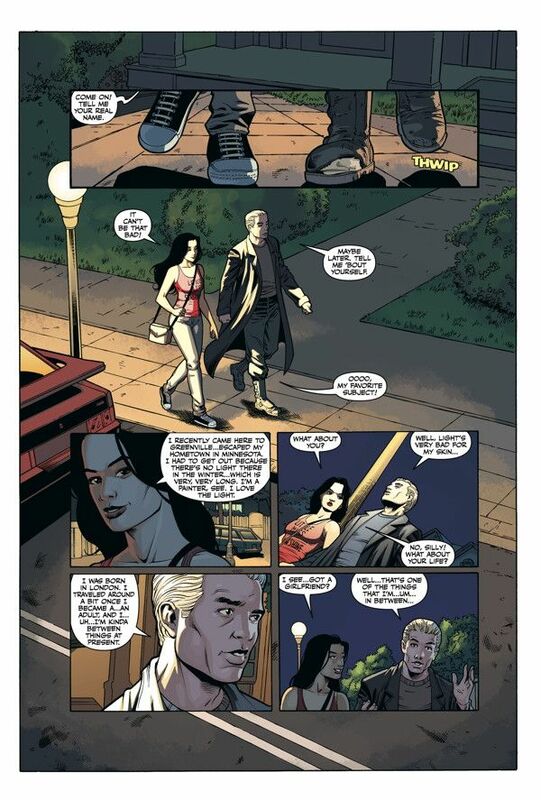 It's no surprise that Marsters nails the character's voice. This is the true Spike. 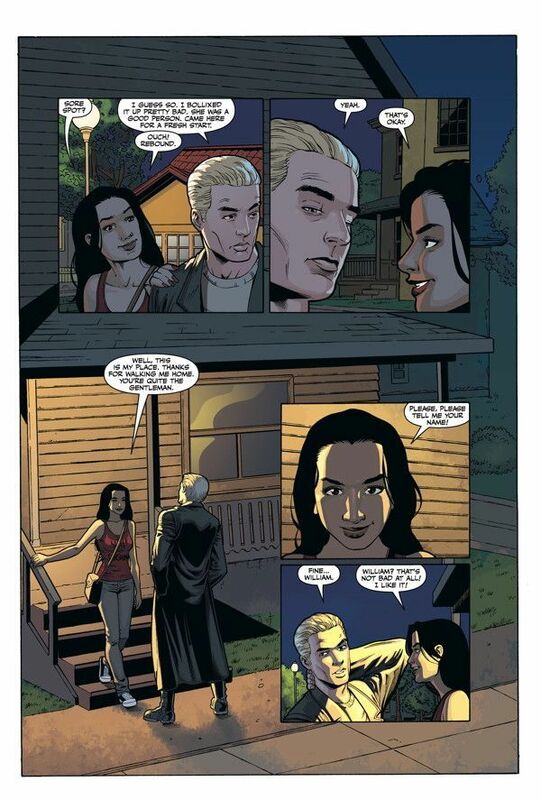 The vampire's depiction in comics as of late has been pretty hit or miss. He was terribly mopey in his most recent mini-series and a real downer in Buffy Season 9. It can be boring read about a depressed vampire, trying desperately to get over a girl that will never love him back. Instead, Into the Light shows a confident, although a little confused man, who is just trying to figure out where he should go and what he should do. He's changed his entire way of life by getting his soul back. There's no place for William the Bloody now. The monster that Spike comes to blows with is suitably terrifying. It starts off like a pretty run-of-the-mill demon. He looks like a devil, with some horns and red skin, but he evolves as the story goes on. I hate to think it's due to whatever he's doing to these children he's kidnapping. These changes end with the creature sporting tendrils on his back like a giant starfish and tentacles flying every which way. It's so much creepier than the initial appearance. Artist Derlis Santacruz did a fantastic job designing it. Speaking of Santacruz, he captures the look of Marsters as Spike perfectly. There's a gruff attitude in nearly every panel, but beneath it is this newfound emotion. While he's capable of ripping someone's throat out, he holds himself in check. 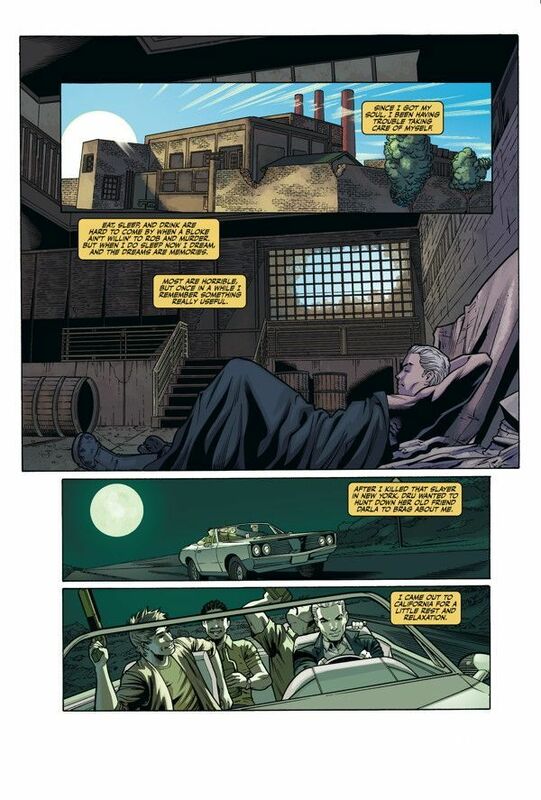 While the story of Spike's journey through this small town is interesting, the demon plot feels tacked on. It's almost as if there was a decent vision as to how to get Spike to grow as a character, but the editors realized we needed something evil for him to punch and threw this in. There's no closure to the demon's tale. We never find out who he is or why he's kidnapping children. He isn't really brought to any sort of justice, so he can definitely come back again. Spike: Into the Light offers a brief look into the life of a fan favorite character from the Buffy franchise. 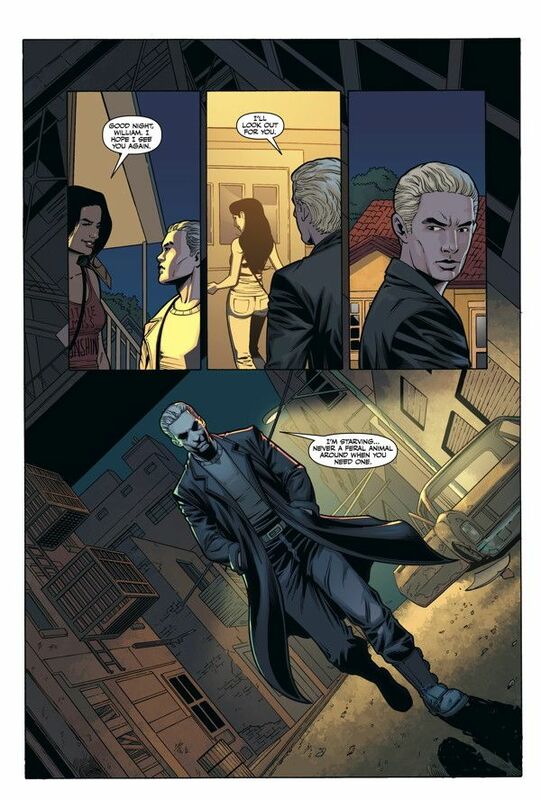 This graphic novel exists between episodes of the TV show, providing you with some more development as Spike learns to be a good guy. He's still the anti-hero that we all know and love, but he's not going to bust into a local store to steal or ruthlessly kill someone to satisfy his hunger.